Photography and Journey. Colors of Sierra Leone, Liberia. Colors of Sierra Leone, Liberia. Map of Sierra Leone and Liberia. Sierra Leonian and Liberian Highlights. 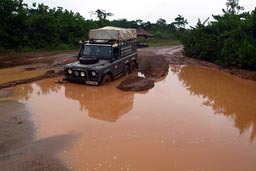 Monrovia to Harper, 800 kms bad roads, Liberia, May2008. Chris and Angela, Monrovia, Liberia, May2008. No2 River Beach, Freetown peninsula, Sierra Leone, May2008. Fishermen on Lumley Beach, Sierra Leone, May2008. 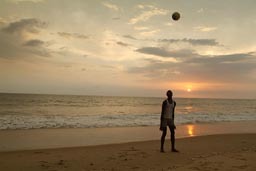 Footballer, Lumley Beach, Sierra Leone, May2008. 20080525 Harper - Liberia, 800 kms of jungle roads. 20080517 Monrovia - Liberia, past civil wars. 20080507 Freetown - Lumley beach. Club Beer in Liberia is a delight, the best beer in Africa so-far. Brewed and bottled in liberia by Monrovia Breweries Inc. 33cl and 65cl. Larger ones are better. Reminds of draught beer.